1. Fill the cans with waterand freeze them overnight. (Freezing makes it easier to hammer a design into the can without damaging the shape of the can.) Don't worry if the bottoms bulge slightly from the pressure of the ice. 2. 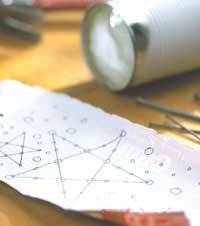 To make the paper pattern, use the wrong side of the label or plain paper trimmed to fit. Fold the paper in quarters to keep the design elements evenly spaced. Unfold and draw lines, stars, chevrons, squares, Vs, or other simple geometric shapes on the paper. 3. Tape the paper over the can, and place the can on a folded towel to protect the work surface. 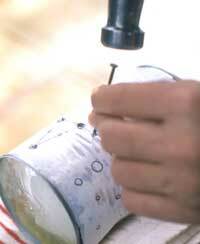 Using the 16-penny nail (for square holes) or awl (for round holes), hammer through the design into the can and ice. 4. Let the ice melt completely. If the bottom of the can became distorted in thefreezer, gently hammer it back in place. 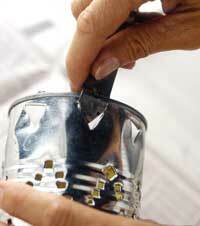 Use the punch-style can opener to make triangular holes along the top and bottom edges of the can. 5. 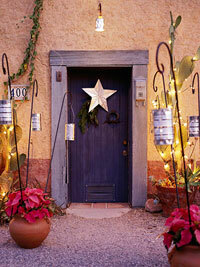 To hang luminarias, cut a 20-inch length of wire and bend it into a U-shape. Insert the ends from the inside of the can to the outside through holes in opposite sides of the can. Curl the ends back over the top of the can. 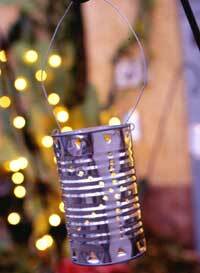 Place a votive candle in the can. Taken from Better Homes & Garden.